A spelt bread dough whipped with the whisk attachment, then left to rise overnight in the refrigerator. 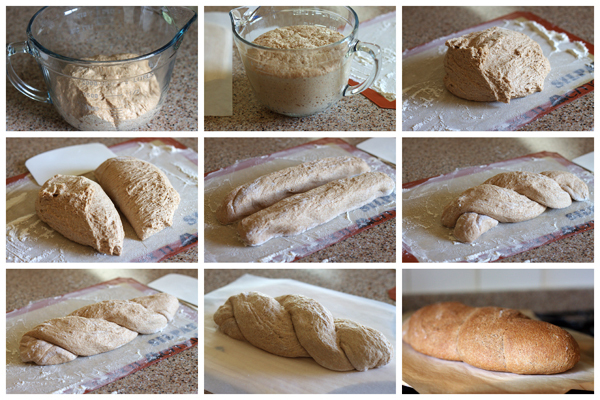 The next day the dough is divided in to two pieces and gently twisted in to a pretty free formed loaf. It’s time again for the Bread Baking Babes and Buddies challenge. This month’s challenge was selected by Ilva of Lucullian Delights. She has the Babes and Buddies baking from a Nordic cookbook called Home Baked: Nordic Recipes and Techniques for Organic Bread and Pastry by Hanne Risgaard, a whipped bread made with spelt flour. Ilva was intrigued with this recipe because it uses the whisk to whip the dough. I know this bread has caused some problems or maybe I should say, it has raised some questions among my fellow Babes, especially about the whisking moment of the recipe, not all of us have a Kenwood or KitchenAid or something along these lines so they did it by hand or with an electrical whisk and some of us used the K-hook, the loose dough attachment. I used the whisk attachment and if you are scared of using it on a bread dough, I can tell you that it works well here because it is one of the doughs that is rather on the looser side but still it isn’t really a wet dough. Luckily, I do have a KitchenAid and the whisk worked really well for me too. The original recipe called for spelt flour and whole-spelt flour. Winco sells spelt flour in the bulk section and I bought what was left in the bin. They don’t however sell whole-spelt flour, so I bought some whole wheat bread flour and used that instead, since no one in our family has problems with gluten. 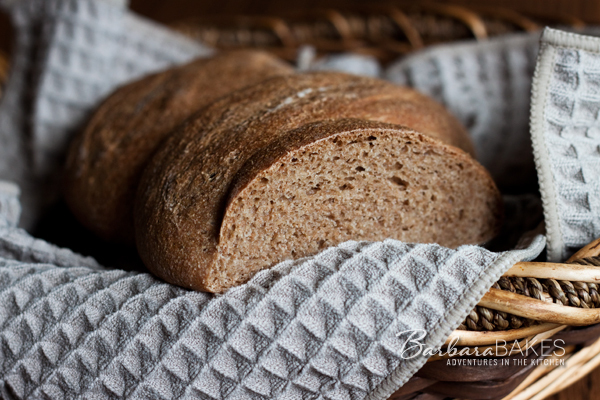 Many people with wheat allergies or sensitivities can enjoy bread made with spelt flour because there is less gluten formation when making bread dough with spelt flour. This recipe is so easy; no kneading, rolling, or filling, just an overnight rest in the fridge to rise and develop flavor. The airy dough made a light whole wheat bread with a thin crispy crust. Perfect for a hearty sandwich or toasted and slathered with butter and jam. In a large mixing bowl, mix the two types of flour, yeast, and salt. Add water and mix the dough at high speed using the whisk attachment until the dough no longer sticks to the sides and bottom of the bowl. Scrape the soft dough off the whisk, put a lid on the mixing bowl, and let the dough rest in the fridge overnight. The next day, remove the dough from the fridge and allow the dough to warm for a couple of hours before continuing. Gently turn the dough onto a generously floured work surface, and dust the top of the dough with a little flour. Divide the dough into two equal-size pieces. Quickly twist the pieces together, preserving as much air in the dough as possible. Place the twisted loaf on a peel lined with parchment paper. Let proof until nearly doubled in volume. Put baking stone in the oven and preheat to 450°F. Mist the loaf with water. Ease the loaf, along with the parchment paper, onto the baking stone. Spray a little water into the oven. Repeat after one minute. After 5 minutes of baking, lower the heat to 400°F, then bake the loaves for another 20-30 minutes more. Hi Barbara, great recipe! I’ve made this once before but in boule form, and I was wondering if I could just use a loaf pan instead or if this recipe has to be baked on a stone? Hi Jessica yes, I think it would make a good loaf of bread too. Let me know how it goes. I’m a little confused about the difference between the spells flours. Is it basically similar to the difference between whole wheat flour and white flour? I have a ton a spelt berries that I want to grind up for this recipe. I haven’t worked with spelt a ton so I’m wondering what your opinion is about me just using 500 grams of freshly ground spelt flour? Maybe adding a couple tablespoons of wheat gluten? Hi Marci – other than this bread, I haven’t use spelt flour so I’m definitely not an expert. My guess is your bread will be very heavy and dense if you use all freshly ground spelt flour from the berries. Could you use a mix of bread flour and fresh spelt flour? I’m assuming the gran has been removed from the spelt flour and not removed from the whole wheat spelt flour. Omitted the salt, added a couple of tablespoons of flax meal. I let my bread stay in the fridge longer as I want it to develop more flavour through the souring process. The only thing I regret is not adding sugar for the yeast to munch on, oh well, I’ll try that the next time. Ah the finish product, pour a few drops of Olive Oil, coupled with grape syrup, let that union soak in together, oh yum yum yum. Thank you for a simple recipe. Thanks for baking with us Barbara. This really was a wonderful bread. This was my first time baking with Spelt and now I’m a believer as they say. I was especially impressed with how my 100% whole spelt wasn’t heavy at all. Your bread looks great Barbara! Mine is just rising now and am hoping it turns out half as good as yours. Wow, I was unable to shape mine in a twist and gave up. I ended up with a boule. Yours is just beautiful!